Artfire's Free Ride program is offering the chance of FREE Verified Account for LIFE! Very exciting! 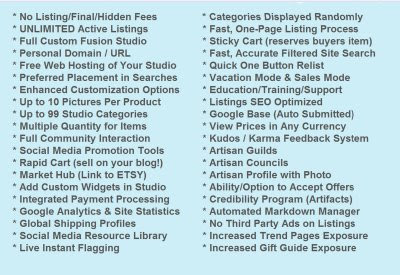 Some readers may know that I've set up on Artfire and have been very impressed, especially since the new style Fusion studios were launched a few weeks ago. I've been planning on converting my free account to a verified account soon and now have a chance to win one for me and one for one of you! To be in with a chance to win a FREE Verified Account for LIFE all you have to do is sign up for a Verified Account with Artfire and, when 12 people sign up through my referral I'll be awarded a free account for me and one to award to the friend of my choice (or a random generator's choice!). Only the Verified Accounts set up in the next 30 days with my name as referrer count, go on, you know you want to! The £7.37 a month is equivalent to listing approximately 36 items on Folksy, before the commission kicks in and without taking re-listing fees into consideration. With all the extra features this makes sense to me and I like the fact that I can know straight away what I'll be paying each month rather than sitting down with a calculator adding up 20p fees and working out commission on EVERY separate listing! I've enough to do in a day without faffing with that! Thanks for visiting my blog :-) Nice to hear of someone else with rescue dogs - had a look at the dog photos on your lovely blog.